France to western Mediterranean, and north west Africa. Gran Canaria Island, Spain,[Canary Ids, off the west coast of Africa]. Approx 8 cm long, depth 2 m, February 1998. Photo: Arthur J. Telle. Grows to approximately 8cm. Typical platydorid with very flattened body, oval mantle with broad mantle and hard granular texture. 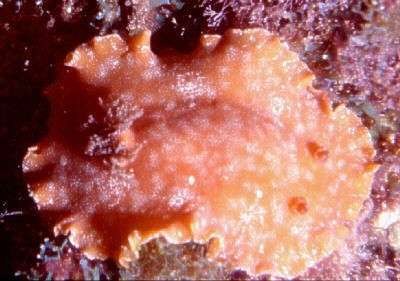 Re: Alien nudibranchs from Maltese waters? Alien nudibranchs from Maltese waters?